This is another of the bars I picked up while I was in the US. I figured a nice milk chocolate bar would be something that would be an easy to eat bar and quite enjoyable. Of themselves, they say “In 1993, a simple but remarkable concept took root in Portland, Oregon. That concept was to handcraft superior chocolates – chocolates that would not only taste exquisite, but that would look exceptional, as well. The result would be a chocolate indulgence for all the senses.” I have to admit the truffles look amazing but I only bought the bar as I knew I’d not have time to review the truffles properly. This is a fun chocolate bar. I was initially attracted by the dark blue wrapper and fun logo and I decided to buy the chocolate because it just looked fun. 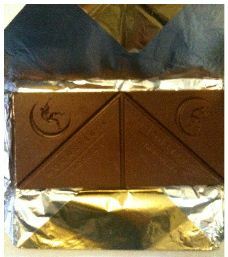 The gold foil has been wrapped on an angle and the chocolate squares are triangles. I decided to do a bit of digging and see why there were so many triangles. They set out to make chocolates that not only tasted different but also looked different and I can’t think of a more radically different look than triangles. Of the milk chocolate, they say “A creamy chocolate sensation. Derived from rare cocoa beans from Java, our Milk Chocolate Bar boasts a 31% cocoa content, resulting in a slightly sweet, full cream flavor with subtle cocoa, caramel and nut background notes.” (American spelling left in tact). It is creamy and extremely sweet. Ever since I low carbed and switched to darker chocolate, milk does taste extremely sweet to me and so it satisfies much more quickly. I wasn’t expecting greatness from this bar and I was not surprised. It has the typical soy lecithin aftertaste along with a strong vanilla flavour. This with the milk chocolate makes it extremely rich but as milk chocolates go I must grudgingly admit Amedei trumps the rest.